Brunel, a Frenchman, escaped in disguise during the French Revolution and went to America. He embarked upon a very successful engineering career in New York but could not forget a young English girl whom he had once met and in 1799 came to England to marry her. He remained in England where he improved the docks at Chatham and Liverpool before taking on his most important and difficult task, the Thames Tunnel from Rotherhithe to Wapping, constructed 1825--43 with the help of his son, Isambard Kingdom Brunel. 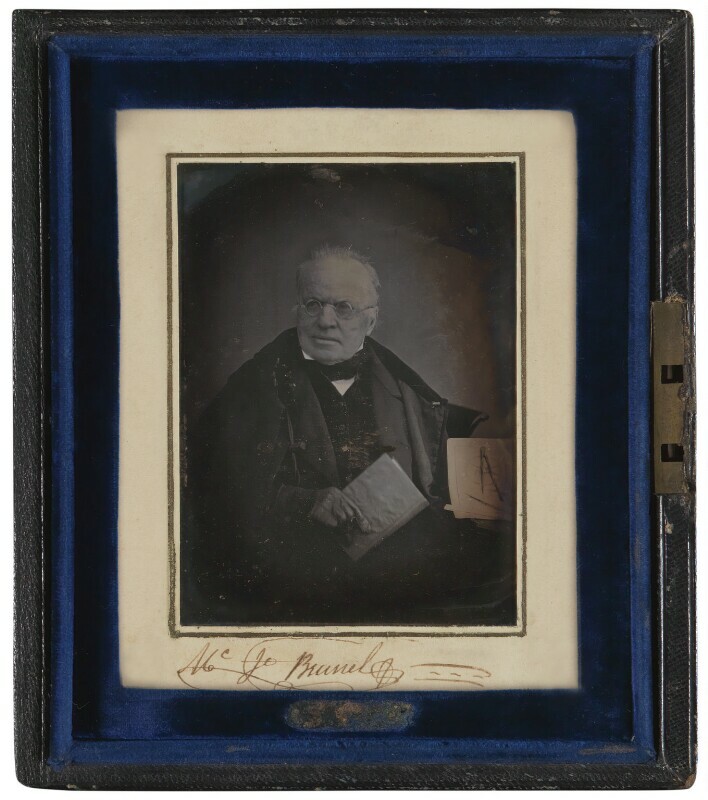 This is probably the only photograph of the sitter and, as a daguerreotype, is a unique image. Cardinal Newman converts to Roman Catholicism. A leader of the Oxford movement , growing in influence since the 1820s, Newman had raised doubts about the authority of the Anglican church. Ralph Etwall, MP for Andover, demands an inquiry into the administration of the Andover workhouse, which leads to the abolition of the Poor Law Commission, and resolution of Parliament to improve workhouse conditions. The American poet, short story writer, critic and leader of the American Romantic movement, Edgar Allan Poe, publishes his narrative poem 'The Raven'. The poem is a supernatural tale of a mysterious talking raven's visit to a distraught lover, who descends into madness, and explores themes of self-torture and obsession. The reconstruction of Trafalgar Square, by architects John Nash and Sir Charles Barry, is completed. Sir John Franklin's expedition in search of the North-West passage, the sea route linking the Atlantic and Pacific oceans. Franklin took two ships, the Erebus and the Terror, and a crew of 129 men made up Royal Navy officers. The crew never returned. Search parties sent out years later discovered the ships had got stuck in frozen waters, and that all the men had died.